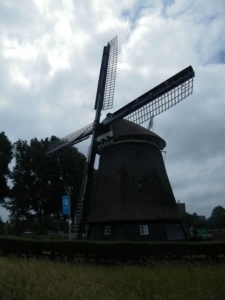 Alkmaar, a beautiful historic city situated some 20 miles north of Amsterdam, is very rich in important windmills. Please note: This trip requires a car and driver (by Dutch law, I cannot be your driver!) and we can start in Amsterdam around 9 AM for a 40 minute drive along pretty flat green landscapes with down chewing grass. In late spring and summer, this combines well with the historic Friday morning cheese market spectacle in Alkmaar between 10-12 AM. As it is my home town, I can show you the best corners. 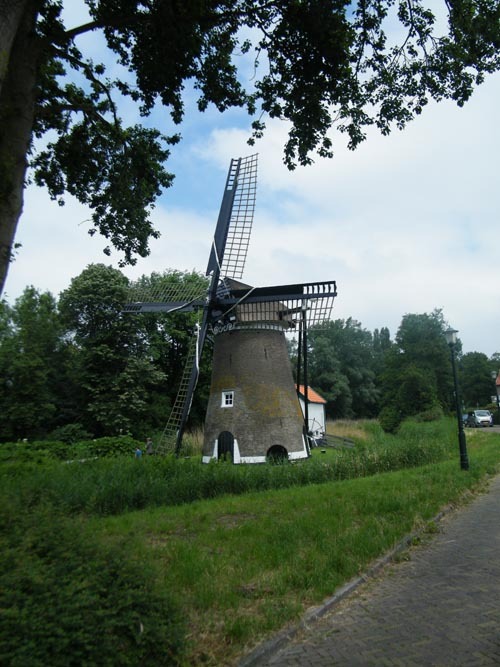 The aim of our engineering tour will be a historic quest for a group of the oldest and most important windmills in The Netherlands. In Alkmaar started the industrial engineering by windmills. For milling grain, water pumping and much more. 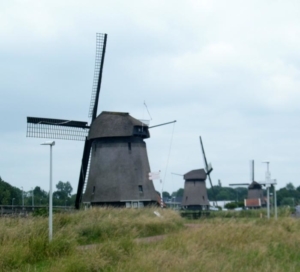 A jaw-dropping series of six handsome water pump windmills are situated at “Zes Wielen” an Oudorp nature park. One can only go there after parking the car and walking on the dyke on foot. Building years: 1627, 1630. 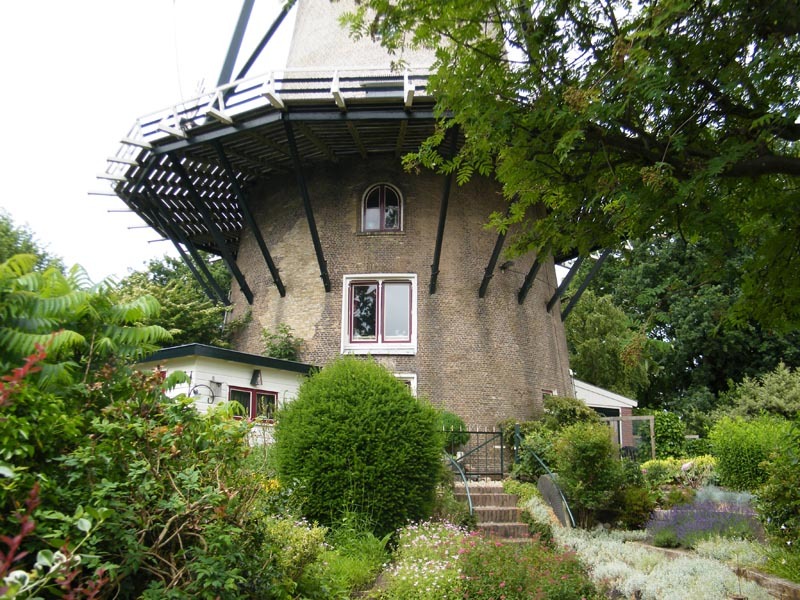 Another one called Red Deer (‘t Roode Hert”) is a grain windmill situated very close by. This one can be visited and climbed. on the inside. The inner wheels in motion high up are a spectacle you will never forget. Inside the staff consists of a professional miller and staff people with a slight handicap. Climbing up is not for the faint-hearted! 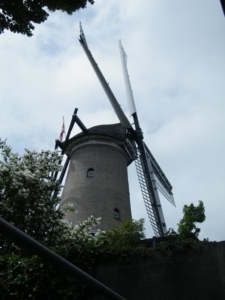 Across the city, raised high on the rampart is Piet’s Mill (“De molen van Piet”), designed to mill grain. Built in 1769. 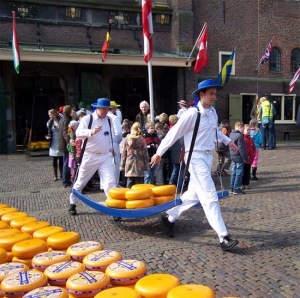 Sometimes open on Friday morning, when the cheese market spectacle is on in Alkmaar. 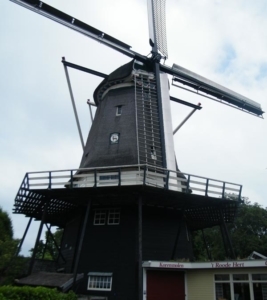 Near the Central railway Station is The Unity (“De Eendracht”) built 1771, again a water pump mill. Another one near by is the “Geestmolen”, built c 1565. 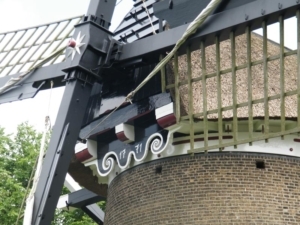 A little to the north is a veritable dinosaur of a water pump windmill built in 1565. It rarely moves its arms. 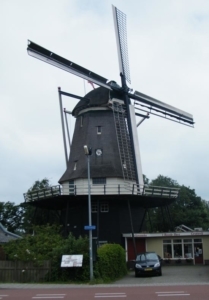 Themes: Windmills, millers, Alkmaar, best group, variety, Molen, functioning, industrial archeology. Subjects: History and Architecture. 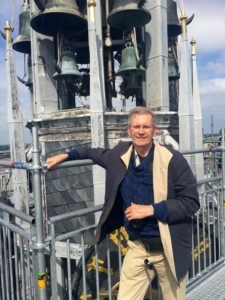 Academic architectural tour by scholar-lecturer, art historian Drs. Kees Kaldenbach. Six Wheels – Zes wielen, Photo Kaldenbach, 2018. 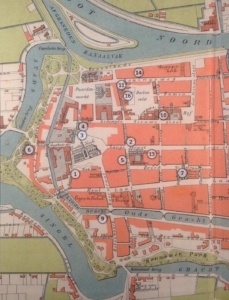 Alkmaar, Six Wheels – zes wielen of which 4 have survived. Looking at the last 3 in line. Photo Kaldenbach, 2018. 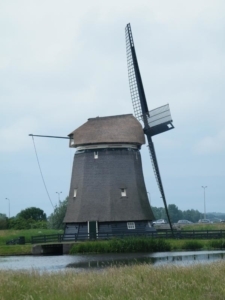 Viaanse Mill, Alkmaar, Photo Kaldenbach, 2018. 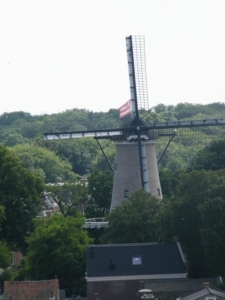 Viaanse Windmill, Alkmaar, Photo Kaldenbach, 2018. 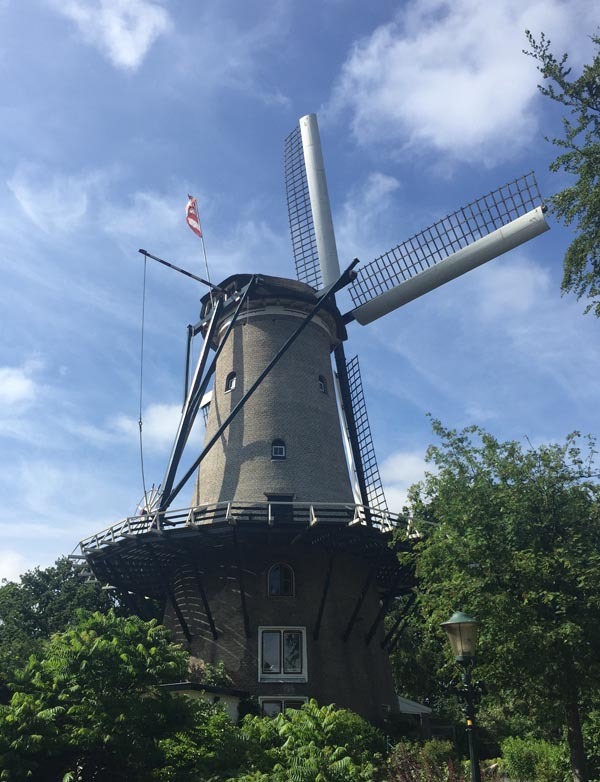 Grain windmill Red Deer – Roode hert, Alkmaar, Photo Kaldenbach, 2018. 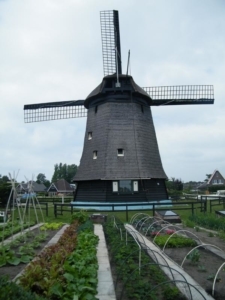 Grain windmill Red Deer – Roode hert, Alkmaar, with shop. Molen van Piet, Alkmaar. Photo Kaldenbach, 2018. 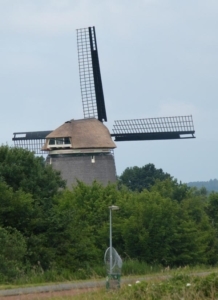 Lower part, Molen van Piet, Alkmaar. Photo Kaldenbach, 2018. 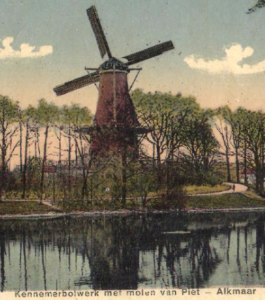 Geest Windmill, Alkmaar. Photo Kaldenbach, 2018. Eendracht windmill, Alkmaar. Photo Kaldenbach, 2018. 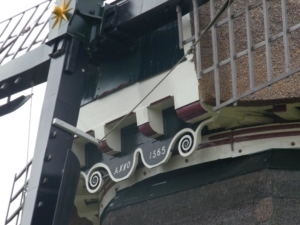 Eendracht windmill, 1771, detail, Alkmaar. Photo Kaldenbach, 2018. Cheese carriers shout HO! Ho! to warn tourists to get out of the way.